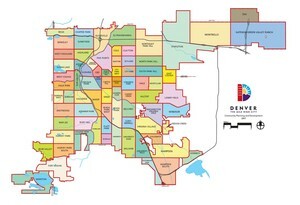 The Lowry neighborhood in Denver, Colorado is one of the most beautiful mixed-use communities in the area, and there are numerous warm and inviting homes ready for you and your family to move into. We moved to the area several years ago, and we’ve been very happy with the place. There are condominiums and townhomes available starting int he mid-$100's0, and single family homes starting in the mid $200's. With newly listed homes at an average price of $500,000-$700,000, they are surely worth looking. The neighborhood, which was once an active Air Force Base, is home to 800 acres of open area and grounds and is a center of parks, restaurants and public art. There are so many things to see and do in the area, whether its entertainment, dining, history or recreation; all of them are just a few minutes away. Even Downtown Denver is only a quick 15 minute drive away. One of the most notable features of the neighborhood is the vast open spaces and parks. Great Lawn is a park of 58 acres of free space full of picnic areas and playgrounds for fun with the entire family. The Wetlands is another reserve that serves as a habitat for wild animals and birds. Lowry is covered with biking and hiking trails for outdoor recreation. The Common Ground Golf Course between Alameda Avenue and Havana Street offers 18 holes of greens for opportune golfing. The Sports Complex in Lowry has courts for basketball, lacrosse, and many other different sports. Big Bear Ice Arena is open all year and holds ice skating rinks. Other than that, there are lots of beautiful public art sculptures across the area. The Reading Garden on 5th and Trenton is almost like one giant exhibit, with amazing sculptures dotting the place, which was designed to be a place for people to read and appreciate literature. The Town Center at Lowry is home to some great history. The Eisenhower Chapel, named after the WWII general and US President, has 200 people seating and is available for weddings and other events. There is also an aviation museum that commemorates the area’s history as an Air Force Base along with numerous restaurants, health care centers, parks and sports arenas across the neighborhood.